Chapala’s nine-day novenario for its patron saint, Saint Francis, including daily processions & nightly music with fireworks castles. This fiesta for the patron saint of one of Ajijic’s six barrios was lost 200 years ago & recently revived. 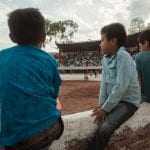 Children’s Day in Ajijic is celebrated with special school events & an afternoon at the lienzo charro. Just like most of Mexico, each town at Lake Chapala has its own patron saint and patroness. Each usually gets its own traditional nine-day novenario, which includes daily processions with Aztec dancers, music, fireworks, and carnival rides. gardeners, carpenters, masons, bus drivers or garbage workers. The procession each evening for the first eight days starts at 6:30 p.m. near the 7-11 on Francisco Madero, except for the last night when it begins at 6:00 p.m. and starts in front of Church San Francisco at the malecón. The procession route on the final day of the nine-day novenario for Saint Francis is a little different than the one above. It starts in front of Church San Francisco instead of the 7-11, proceeds north on Francisco Madero until it reaches the 7-11, then turns and heads back towards the malecón to end at the church for an outdoor mass. Taking a ride on a horse along the lakeshore is a great way to end the day at Lake Chapala. Most towns in Mexico have their own patron saint & Virgin which people celebrate each year with multi-day fiestas. Ajijic’s patroness is Our Lady of the Rosary, who is honored for the entire month of October, culminating in a grand procession & festival on October 31. Mexico’s most famous holiday is celebrated in full force in the towns of Ajijic, Chapala, and Ixtlahuacán de los Membrillos. A jimador uses a mule to transport freshly cut agave piñas from the field to the truck in an agave field in Arandas, Jalisco.